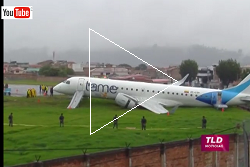 On landing in rainy conditions, the aircraft skidded off the end of the runway at Cuenca and sustained substantial damage. Passengers and crewmembers were able to evacuate safely . 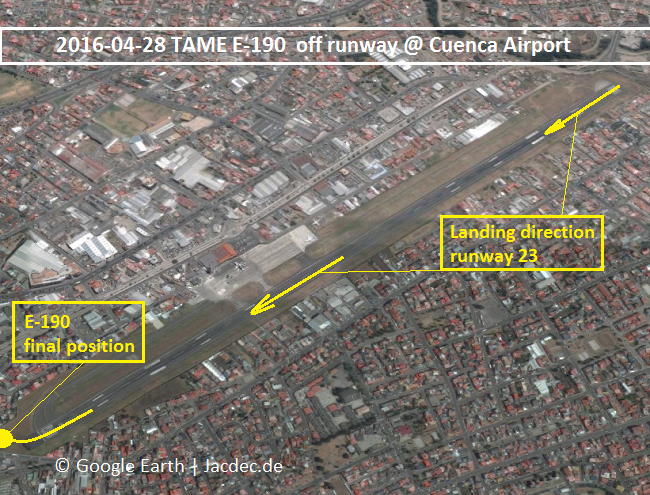 TAME flight EQ 173 landed on runway 23 (lengh = 1900 meters) in rain. 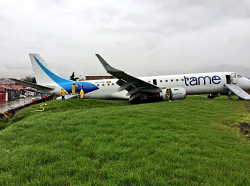 Despite wheel brakes and reverse thrust activated, the pilots were unable to stop the Embraer Jet within runway lengh. At the end of the runway, the plande skidded sideways, ran across the grass whare its entire undercarriage collapsed or dug in. The aircraft came to rest in a near reciprocal heading resting on its tail and engines in rain-softened ground very close to downsloping terrain and a brick wall demarcate the airport boundary to a public street. Evacuation was initiated via onboard slides. It is understood that nobody was injured in the occurence. At the time it was raining badly and many patches of standing water have formed on the runway and taxiways. 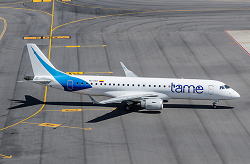 Cuenca Airport was forced to close for an indefinite time. The airport is located at an elevation of 8.306 feet. 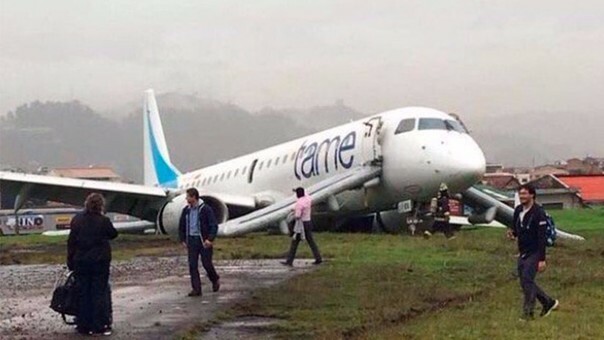 NOTE: On Sep. 16th 2011 another E-190 of the airline overran the runway at Quito (old Mariscal Sucre Airport) once before in similar conditions.